Toyota Alphard has impressed many by its extravagant appearance and super luxurious and comfortable interior. To keep this trend going, Toyota updated the Alphard earlier in 2018 and added more features like a full-height grille at the front with a lot of chrome, slightly updated headlights, new tail light clusters, etc. Toyota also updated the engine of the new Alphard. Now, the Alphard comes with a powerful 3.5-litre V6 engine with D-4S direct injection. It produces 300 PS and 361 Nm. Toyota has also included a new 8-speed automatic transmission. The interior of the Alphard offers a great experience as it is super spacious. The captain seats are very luxurious and comfortable. Features like a full display rearview mirror, LED ceiling illumination, 3-zone AC, and a smart entry and start system make the Alphard one of its kind. There is only a single variant of the Alphard and it comes at a price of RM 443,000. You do get four color options. Have a question on Alphard? Alphard is available in 4 different colors - Black, Steel Silver Metallic, Graphite Shadow and White Pearl Crystal Shine. At the time of its arrival, the Toyota Alphard recreated the benchmarks of the MPV segment with its distinctive looks and opulent appeal, the traits which were usually unseen in an MPV. With features and luxury comparable to high-end luxury cars, the Toyota Alphard is possibly the best an MPV can be. In Malaysia, the Toyota Alphard is offered in two different variants and the color options of White Pearl, Luxury White Pearl, Black, and Graphite Metallic. No matter how loud and exuberant the Alphard might look on the outside, but as soon as you step into the cabin, you will be quite surprised by the simple layout. However, it is equally pleasant and sophisticated space to be in. The four-spoke steering wheel with its vertical design for the center boss actually mimics the design of the front grille. The two pod instrument console, otherwise, has a very conventional layout with a colored MID screen between two analog dials which give it a modern appeal. The centre console has a wide and inverted trapezoidal layout, thus exaggerating the overall look of the dashboard. The dashboard finish feels quite luxurious, however, the dated looking buttons for the touchscreen infotainment system as well as automatic climate don’t gel well with the futuristic theme of the car. As expected, the Toyota Alphard is loaded with comfort and convenience features, the most prominent of which are the VIP seats with control panel and table service, LED ceiling illumination, and 3-zone climate control. The captain layout of the seats as well as the ambient lighting makes the interior of the Alphard feel like a lounge. Thanks to the presence of large glass areas and perfect placement of the seats, the Alphard feels very spacious on the inside. When seen from the outside, the Toyota Alphard breaks the norms of a conventional MPV and looks quite distinctive. However, this very unique and boxy design, full of busy elements makes it a bit too loud for the conventional MPV buyer category. What catches the attention at the very first moment is the giant chrome grille at the front. This grille looks wide and has a vertical layout, which gets a combination of horizontal and vertical chrome lines. At the upper end of the grille is positioned a thick chrome slat and Toyota’s premium logo. There are two diagonal chrome slats on the sides, which blend into the full LED headlamps with daytime running LEDs. 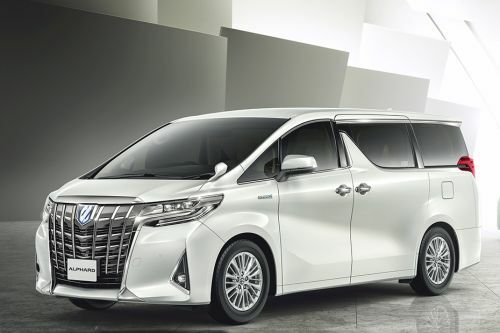 From the sides, the Toyota Alphard carries forward the bold appeal initiated by its front fascia, however the long wheelbase and short bonnet make it feel what it actually is – a minivan. The door mounted rear view mirrors and diamond cut alloy wheels take forward the premium appeal of the Alphard. From the rear, the Alphard gets the quintessential squared and boxy look, however, the horizontally laid S-shaped LED tail lamps is something which makes it look interesting. The Toyota Alphard is being offered in both 7- and 8-seating configurations. Due to a long wheelbase of 3000 mm and a height of 1890 mm, the Alphard is extremely roomy to seat up to 8 passengers with immense comfort. With MacPherson struts at the front and double wishbone setup at the rear, the Alphard offers a very soft and plush ride quality. In the Malaysian market, the Toyota Alphard is available with one petrol engine. Mated to an 8-speed automatic gearbox, this 3.5-litre dual VVT-I V6 petrol motor produces 298 PS of maximum power and 361 Nm of peak torque output. However, given the overall kerb weight and massive size of the Alphard, it returns a low fuel efficiency. The Toyota Alphard is fully loaded in terms of safety features, such as front, side, knee and curtain airbags, ABS with EBD and brake assist, vehicle stability control, hill launch assist, blind spot monitoring system, rear cross traffic alert, front and rear parking sensors, and ISOFIX mounts for child seats. The Toyota Alphard offers a rare combination of the versatility and usability of a big MPV and the luxurious appeal, comfort levels and opulence of a high-end luxury sedan. The extrovert design might take some time to get used to, but the elegant interiors and plethora of comfort and convenience features make it a proper luxury vehicle. What are the Safety Features Available in Toyota Alphard?